The Managed Metadata service application allows us to centrally manage Metadata and content types which can be shared across SharePoint Farms, Web Applications, Site Collections, Sites and Lists. Content Type Hub allows the centralization and sharing of Content Types through the Managed Metadata Service Application. 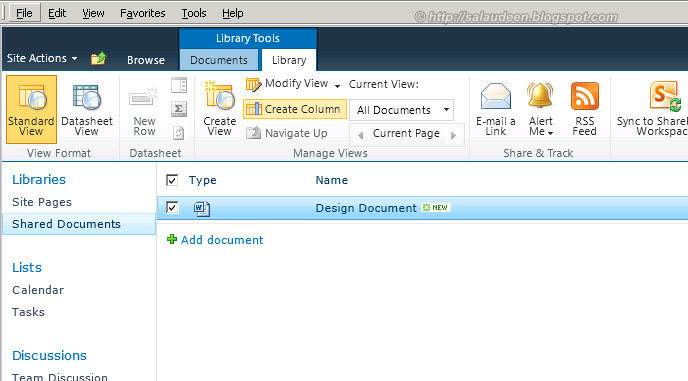 In SharePoint 2007 content types were bound to site collections. This was a pain since we had to create content types from the scratch when moving from one site collection to another. 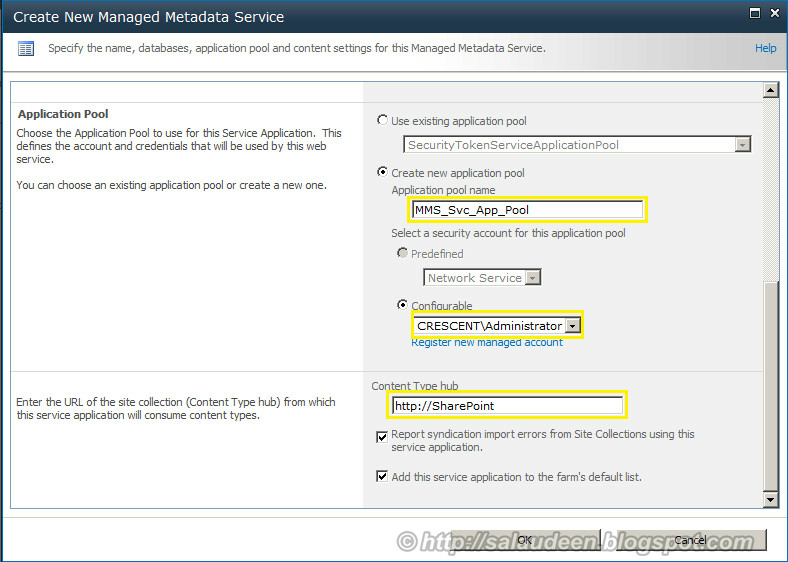 Now in SharePoint 2010 with managed metadata service application's content type hub feature you can centrally manage content types, share and re-use them across Farm, Web applications and site collections. By definitions, content type Hub is the site collection which will host the content types that are shared. Content type syndication is the process of sharing the content type across the enterprise. MMS provides Term store management tool to collect and share terms farm wide which makes the Managing & Finding content easier. These terms can be predefined and controlled centrally by a small number of persons (taxonomy) or opened to all users (folksonomy). You can use these terms across your web applications as metadata columns and tags. 2.1 How to Publish Content Type? 1. 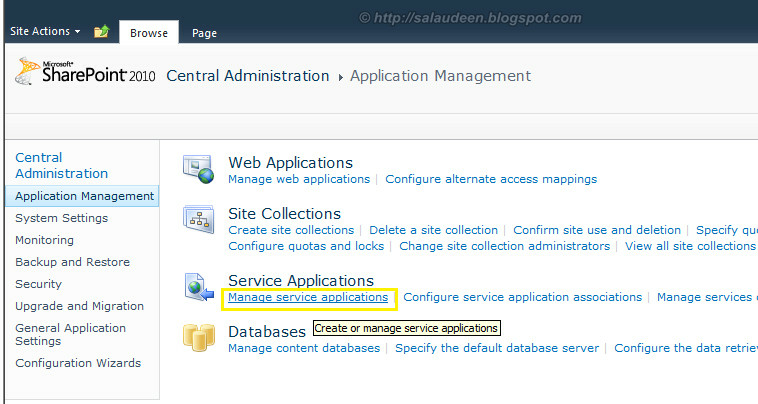 Go to Central Administration, Click on Application Management and then click on Manage service applications link. 2. In the ribbon, Click on the New item and select Managed Metadata Service. 2) Enter a name for Managed Metadata Service, say "Managed Metadata Service". 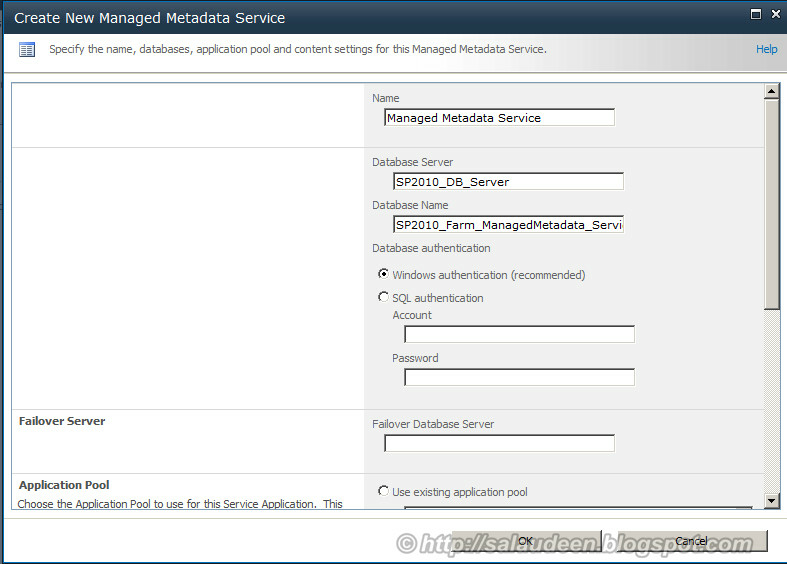 Fill the other details such as database server name (DB Server of SharePoint), Managed Metadata service’s database name. 3) Scroll down and enter the Application Pool account, Managed Account details. Specify the content type hub. 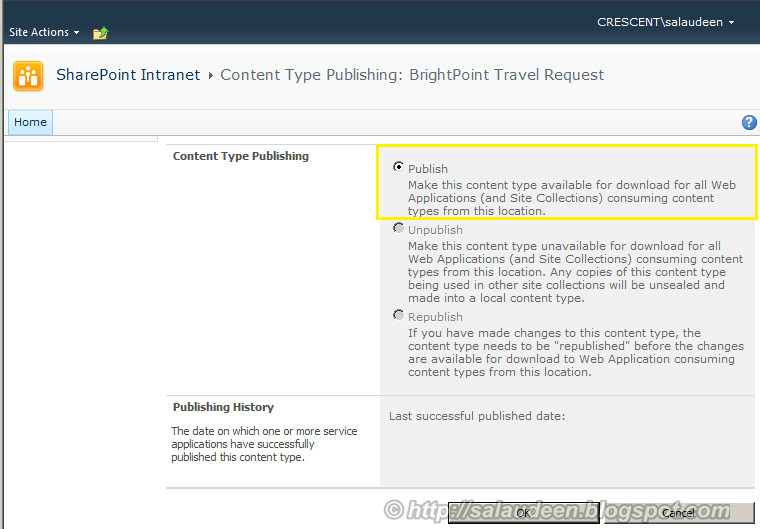 Determine location of Content Type Hub: Be aware when entering the content type hub when creating Managed Metadata service application. You can’t simply change the content type hub afterwards. (Only option left is recreating the MMS service). Make sure you are typing the correct URL without any typo and without page names like default.aspx Click OK button at the bottom to create Managed Metadata service application. If you failed to do the above step, Then you can expect the below errors while accessing Term store or MMS Service connection. 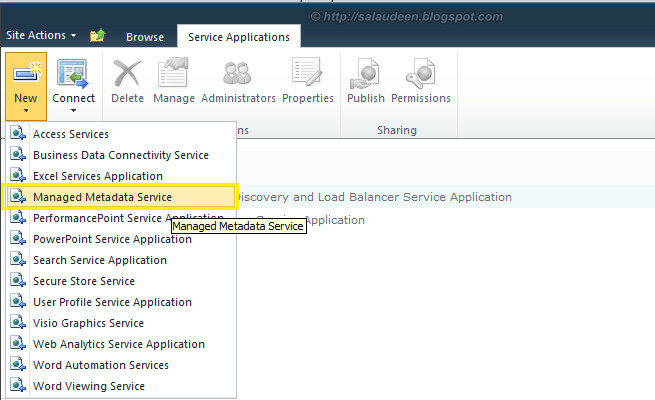 Central Administration >> Manage Service Applications and click Managed Metadata Service Connection and then “Properties” from the ribbon. Tick the Check box “This service application is the default storage location for column specific term sets.” and click OK button at the bottom to save the changes. If you failed to do the above steps, you will get: The Default Term store for this site cannot be identified. Error when you try to add a new Managed Metadata column in lists. 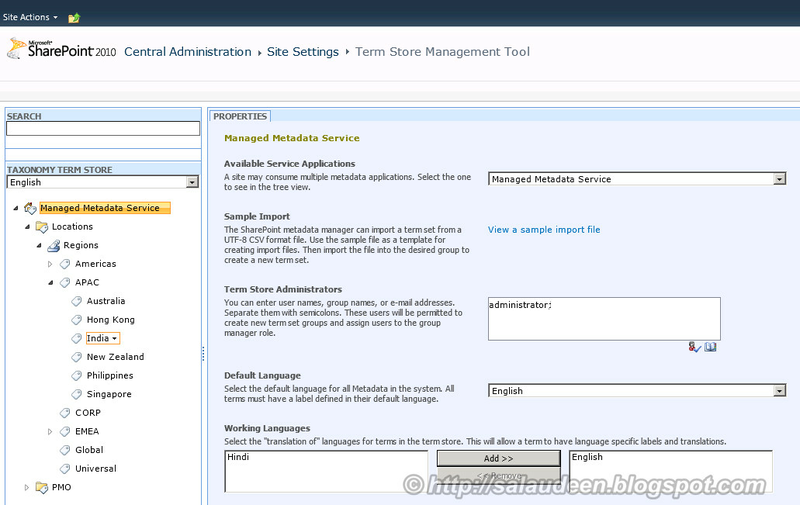 Now we have successfully setup Managed Metadata Service, let’s get into the Term Store Management tool by navigating to on the newly created Managed Metadata Service Application. Content Type Hub is a central location where you can manage and publish your content types to the subscribed sites. 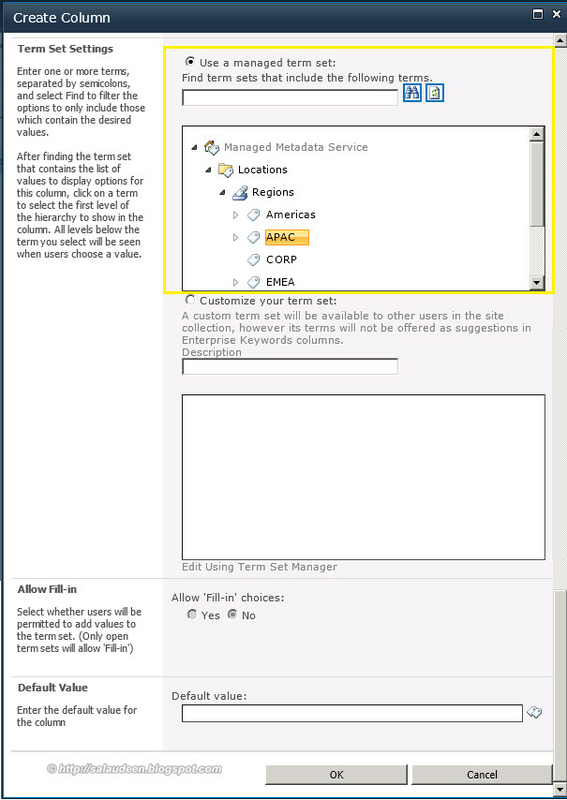 We have to specify the location of content type hub during setting up the MMS service application. In order to maintain the consistency and avoid rework content types must be published from the content type hub and can be consumed from other site collections. Important: In the content type hub, make sure Content type syndication Hub feature is activated under the site collection features. Otherwise you will not get options to publish content types. Activate this feature only in CT HUB. Go to the Content Type Hub site, create required content types. Once done, go to Site Actions >>Site Settings. Click on Site content types Under Galleries. In Settings section of Content type Click on "Manage publishing for this content type" and On Content type publishing selects "Publish" and clicks on "OK" button. 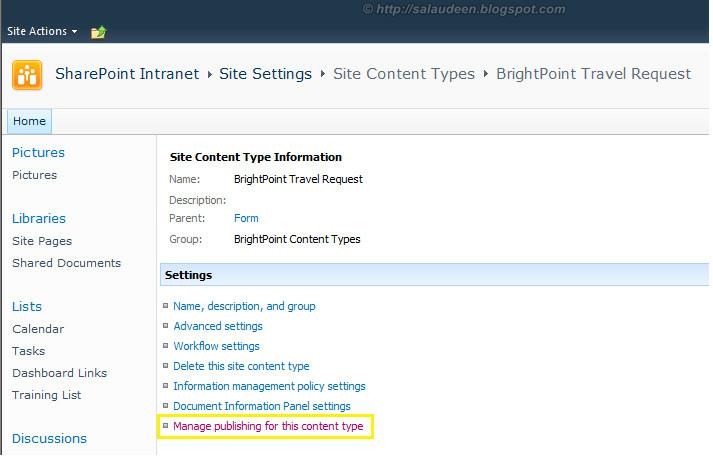 Click the Manage content type publishing and Check the Publish Radio button and say OK. Content type is published, but not available in other site collections? After this we may require to run Timer jobs manually first time to publish the content type. 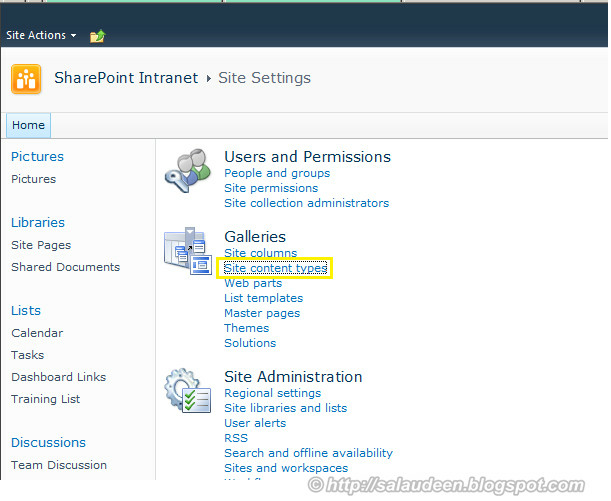 Go to "SharePoint 2010 Central Administration" -> Click on Monitoring -> Click on Review job definitions. There are 3 timer jobs that will run at pre-defined intervals to push the content types across to other site collections that share the same Web Application. Once done, you will find the content the Site Content type which we created in above Site Collection in any of the site collections subscribed to content type Hub. Just go to the Site Actions >> Site Settings, Under the Galleries click the Site Content Types. · What will happen when you Un-Publish a Content Type? This will create local copies of the content type and the data will be intact. · Can I change the content type from Subscribed sites? No. You can’t change the synchronized content Type inside the subscribed Site Collections because the published content types from Hub will be in Read-Only mode in the subscribed sites. You have to do such changes from the Content type hub only. · Does it support document templates/Document Sets? Yes, it supports both. 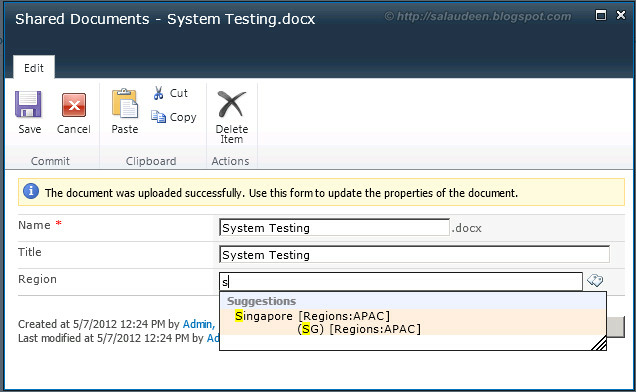 But make sure document set feature is activated in the target site. This applies to all other features as well. · Does it support Custom Fields types? Yes, you can associate workflows with content types. The association will be published but not the workflow itself. · What's the case when I have multiple MMS service application? The default MMS gets the priority and will be your content type hub. · What will happen when a column is removed from Content Type in Content Type Hub? When deleted and re-published in Content type Hub, same column will be removed from the Site Content Type of the subscribed sites. If you want to check for problems you can check at the Publisher or at the Subscriber sides. Click on the site collection’s Site Settings. Under the Site Collection Administration click on Content type service application error log. SharePoint Server 2010 includes the Term Store Management Tool, which you use to create and manage term sets. 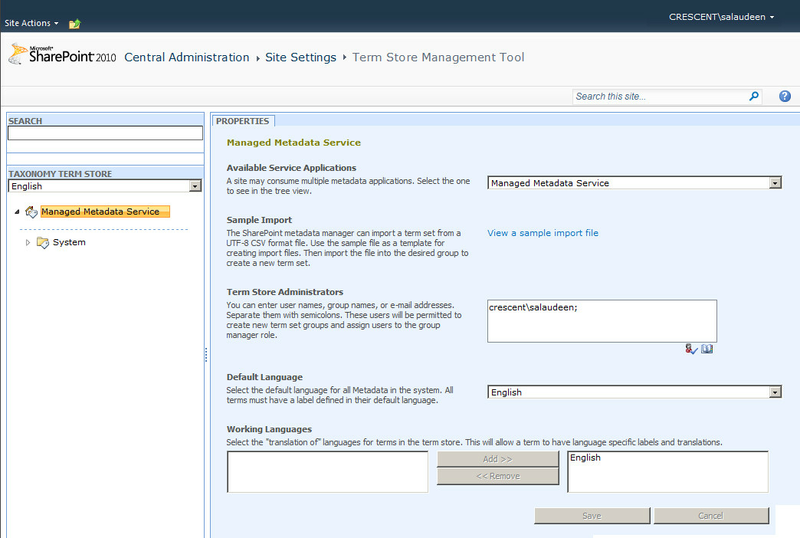 If you have the appropriate permissions, you can use the Term Store Management Tool to manipulate terms & keywords. Before diving into Term store, Lets familiarize our self with some definitions. Term Store: This is the database in which our managed metadata is stored in. “Taxonomy” are predefined words or phrases that can only be created by users with the appropriate permissions and are often organized into a hierarchy. “Folksonomy” are words or phrases that have been added by the end user. All enterprise keywords are part of a single, non-hierarchical term set called the keyword set. Term Group: is a collection of Term Sets. A Term store can have multiple groups. Security is set on this level. Available for Tagging – Checkbox determines whether the particular term set/term is enabled or not. Open vs. Closed Term Sets: Closed terms sets are not open for modifications. Term Group Managers vs. Contributors - Both can contribute to Term set, but Group Managers can add users to either of the group. Once you have the MMS Ready, you can Import, create/Manipulate items inside. Now, you can Create/import Terms. Metadata navigation allows users to filter list and library views instantly based on Meta data terms while key filters allows for greater refinement. Enabling metadata navigation automatically indexes list columns by default. Now see it in action from left navigation. Unable to find "Metadata Navigation Settings" in Document Library/List Settings? You have to Enable the feature: Metadata Navigation and Filtering. Go to: Site Settings >> Manage Site Features >> activate “Metadata Navigation and Filtering” feature! Now we have our Metadata ready. Let’s create a metadata column in a list to consume the metadata from metadata store. Click on “Create Column” on the desired list/library. Give a name to the column. 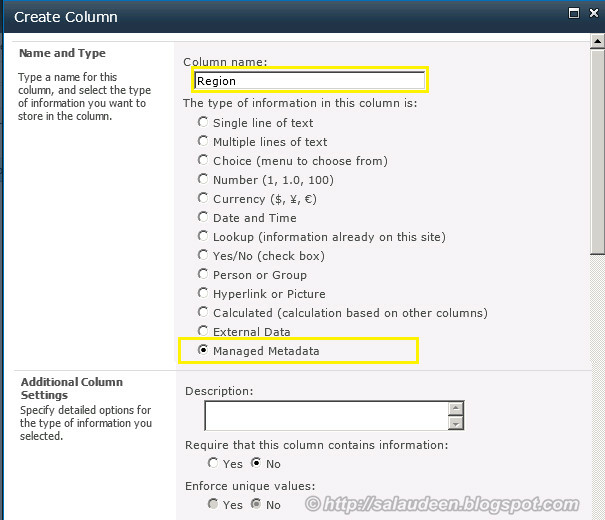 Select the column type as Managed Metadata. That’s all. We are done. 5. In view Filters can't use Begins with or contains operators. 8. Office 2003/2007 clients not supported. 9. In SPD workflows you can’t directly use the name of the term, but you have to use the GUID of the term. 10. 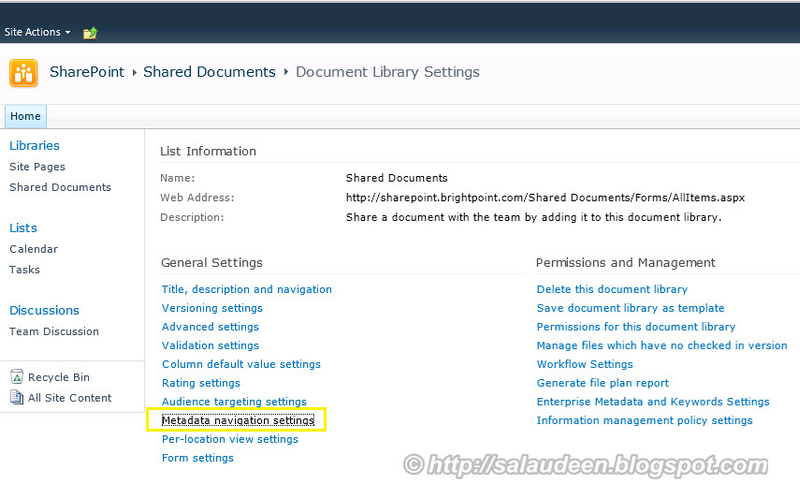 You can’t add Managed Metadata columns from SharePoint designer. Local term sets are created within the context of a site collection. 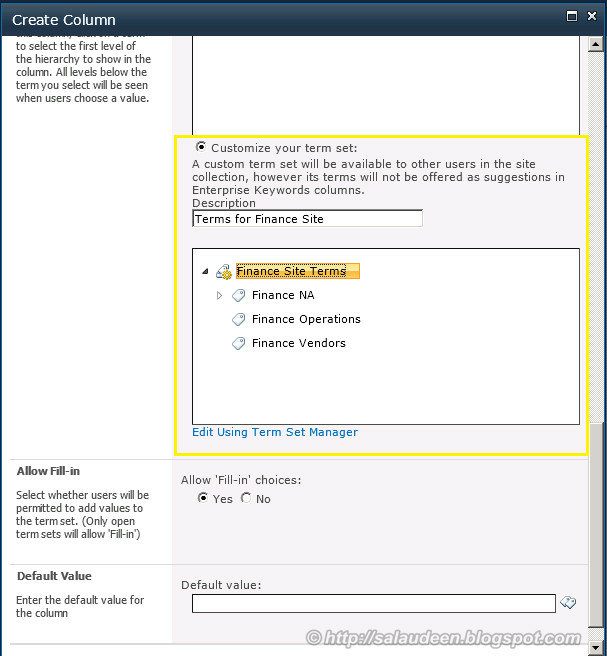 While creating a Metadata column, if you choose “Customize your term set” option, this creates a Local terms store available to all the users scoped with in the current site collection. To manipulate local term store you need to have either full control or site collection admin rights. Excellent Its worth a million dollars ! Very informative. Thanks a lot ! 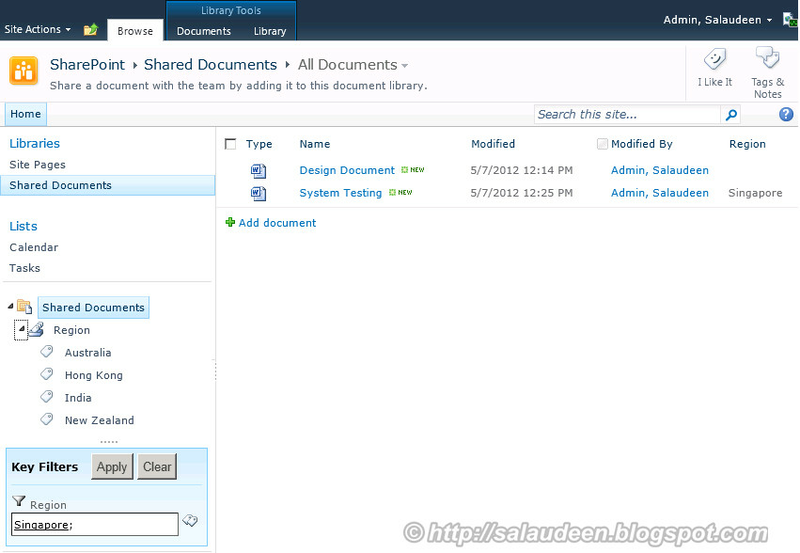 Hi salaudeen can you give some explanation on how to achieve "re-assign" task in a share point designer 2010 workflow?? The user can choose a name from people picker and click the re-assign button and the task will be assigned to them. This is what i need to know. Please let me know. Thanks in advance. I am unable to rename the group terms and/or term sets on Central admin. Also, i don't see the term store in site collections. I am an admin on all the site and CA as well.Please let me know what is going wrong. Enable-SPFeature -id “73EF14B1-13A9-416b-A9B5-ECECA2B0604C” -Url http://site-collection-url. You have to add your self as Term store Administrator to resolve your first issue. Let me kmow the outcome. great post! do you know is there a way to organzie the data better? for example we have tons of terms and you just have to scroll and scroll through all the options in the form. Is it possible to make it a pop-up box to show more items at once? Hi when I try to start this service the page goes to processing and just hangs there. 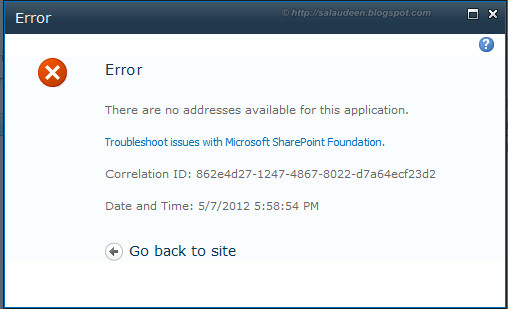 Also I noticed that the SharePoint Foundation web application service will get stuck in provisioning. I forced it to online with Powershell but I think there is still something stuck/hanging. Any thoughts?